In this exciting and in-depth Part 2 episode on the 2016 Presidential Election, Dark Journalist Daniel Liszt welcomes Former US Assistant HUD Secretary Catherine Austin Fitts back to the show. Catherine breaks down where the Black Budget Deep State forces have placed their hopes in the presidential race between Republican Donald Trump and Democrat Hillary Clinton. She sees Elite Panic in a shadow network emerging of the Bush Political Family, Goldman Sachs, Neocon Militarists, Corporate Globalists and the Establishment Media all lining up behind a Clinton Presidency in order to continue the destructive policies of financial harvesting, political secrecy and aggressive militarism around the globe. Catherine sees the election coming down Human vs. Inhuman with the Transhumanist policies of Computer Micro-chipping of American citizens as a major example of the push for dominance by covert forces driven by a lust for control. She sees recent outbreaks of violence in public as the prototyping of a new technology that is meant to drive a divide and conquer wedge between demographic groups of men/women, black/white, rich/poor, to in effect ‘Weaponize The Population’ to distract from the massive financial fraud and political corruption taking place. The propaganda that the corporate media has engaged in during this campaign has signaled their desperation to keep the corrupt power structure in place. Their relentless targeting of Trump shows that they regard him as a threat to the Deep State political forces that have been trying to create a Totalitarian One World Global Government. The collusion of corporate Wall Street and political forces have decided Trump must be stopped at all costs or they risk dangerous exposure and scandal on a level never before seen in history! The upstart group Wikileaks has been publishing secret documents which reveal the insidious nature the Clinton Machine and its close relationship to the ruling media elite. Julian Assange, who leads this bold team of computer sleuths, had been targeted by Hillary Clinton while she was Secretary of State for a drone strike and recently was denied internet access by the Ecuadorian Embassy in the UK where he resides trying to elude a Kangaroo Court sham legal prosecution. Catherine sees Assange in danger of elimination and believes that DNC staffer Seth Rich was assassinated last Summer because he was secretly sending documents to Wikileaks. It has been hinted that in addition to releasing the emails of the Clinton Campaign Team, Wikileaks may hold a secret set of documents that can change the entire face of the presidential race by exposing Hillary Clinton and the entrenched Democrat Power Structure to serious charges and political oblivion This may be related to the recent reopening of the Clinton Email Server Case by the FBI. Americans, arguably, have more ‘stuff’ than any other group of people on this planet. We have plastic stuff, fluffy stuff, cute stuff, and ‘cool’ stuff. We have too many clothes, too many gadgets, and profuse knick-knacks. Yes, even other ‘stuff’ to hold our overflowing ‘stuff.’ There’s a great George Carlin quote that sums it all up – “Your house is just a place to store your stuff while you go out and get more stuff.” All this stuff is wrecking havoc on our health, though. In fact, it’s messing with our heads. To be fair, we collect things for different reasons. Maybe a rusted out old car is sitting on the front lawn because someone intended to repair it. An old sweater that we will never wear again collects dust in our closet because it is the only relic we have left of a special relationship. Even smaller items that we collect, though, add to the clutter that is starting to take over our lives, and our minds. It can be a killer pair of shoes or even an old novel that is taking up space in our abodes, but it turns out that those things are taking up precious space in our heads, too. Arguably, there is real, physiological pain experienced by many people when we have to give u pour stuff, too. Yale researchers have identified two areas of our brain that associate letting go of our things with pain. It is the exact same type of pain we experience from getting a paper cut or drinking too-hot coffee. We seem to value our possessions so much that the loss of them causes us real, palpable discomfort. Advertisers are well aware that we like our stuff, and use that to their advantage too. Among other techniques to get us to purchase more stuff that we might not need, like mimicking our physical gestures, or being rude so that we’ll spend more, retailers also encourage us to touch products so that we will start to ‘own’ them mentally before we’ve ever even laid out cash to pay for them. This tactic is so effective we’re willing to spend up to 40 percent more for something in its physical form that we can touch and feel, rather than a product that is just presented in pictures. You can be a full-fledged hoarder, or ‘chronically disorganized’ as the mental health profession likes to call it, but even just a few extra things in your surroundings can cause you to be disjointed mentally, and pulled forward or back in time, making it impossible to be present and engaged with life. Ironically, Americans are also some of the most debt-ridden people in first world nations, too. While an indigenous tribe member in Papa New Guinea isn’t collecting more than they need, Americans collectively owe more than $700 million in consumer debt. This is a drop in the bucket in comparison to our banks and government, which have now capped the debt ceiling at around $17 trillion, while it mysteriously grows larger behind a secretive cover, but we definitely pay more than we ever dreamed to own another thing that doesn’t really bring us joy or peace. When we pay exorbitant interest on all that stuff we’ve collected, it also means we’ve shelled out around three to five times what its actually worth. Though reduced income, unemployment, divorce, and medical expenses are among the reasons we go into debt, many of us are also financing a habit of collecting more stuff. Don’t take my word for it. OfferUp, a mobile marketplace that traffics in used goods, conducted a poll which revealed that more than 1,300 adults surveyed, revealed that many Americans consider themselves burdened with material objects they no longer want nor need. More than half of those surveyed said they though their homes were too cluttered. Unsurprisingly, 84 percent of those people said they were also facing financial challenges. One in seven said that they had rooms in their homes that were so full of junk that they didn’t even use them any more. Study after study has proven that excess clutter interferes with our creativity, shuts down centers in the brain responsible for feelings of joy and calm, and makes people feel overwhelmed with life. Clutter signals to our brains that the work is never done, and therefore we never really relax. Having too much stuff can also stop new things, people, and ideas from coming into our lives. We’ve essentially got no room for them, and so the Universe doesn’t send more of what we really need. It’s waiting for us to let go of the things we don’t need, first. From a Feng Shui perspective, too much stuff causes low, stagnant, blocked energy that drains you and lowers the quality of your life. There has even been an association between holding onto clutter and being overweight. A mess causes stress, there’s no getting around that fact, but there are ways to get control of the clutter, and your life. Don’t try to do it all at once – Commit to spending 30 minutes a day cleaning out the clutter. More than that can be too emotionally taxing for many people. Take it in three’s – You can take three large boxes, and label them, ‘trash,’ ‘give away,’ and ‘charity. The trash box is going to recycle or the dump. The give away box can be items you know friends and family can still use, and the charity box will serve as a way to get rid of everything else. Don’t think too hard – You can start with things that are easier to let go of – like a pile of junk mail you haven’t had time to go through or clothes you know for sure don’t fit you or are out of style. When you get to things which you are more emotionally attached to, say to yourself, “I set you free to bring someone else happiness,’ and let them go. Don’t think too much about it. You’d be surprised how little that ‘thing’ means to you once its been out of your life for a little while, and what wonderful new things or experiences come to replace it. Treat yourself – Make sure that you offer yourself a psychological reward for cleaning out clutter. If you just gave ten pairs of jeans to Goodwill that you’ll never wear again, give yourself permission to buy ONE perfect pair that fits you. Did you just dump piles of paper from your office desk? Pretty up that space with some fresh flowers, and enjoy the extra life and joy that this brings you. Posted on September 8, 2016 Categories Big Entertainment, Economy & Finance, NewsTags Advertising, Debt, Economy, Finance, Materialism, Possessions, The IndividualLeave a comment on Do You Own Your Stuff, or Does it Own You? The desire of the Left-leaning “mainstream” media to ensure that Democratic presidential nominee Hillary Clinton defeats GOP rival Donald J. Trump may be so strong that anyone who dares question anything about Clinton’s past, her various scandals or even her health will be dealt with harshly. Sound like a conspiracy theory? Then why else would popular TV star Dr. Drew Pinsky’s show be canceled just days after comments he made regarding Clinton’s questionable health made national headlines? As we reported earlier this month, Pinsky – or Dr. Drew as he is better known – dropped a bombshell after he appeared on a radio show in California and was asked to “debunk questions” concerning Clinton’s health. The board-certified internist and addiction medicine specialist said he was actually “gravely concerned” about her physical health and well-being, adding that it appeared that the medications she was being prescribed for her thyroid and blood clotting problems were antiquated. 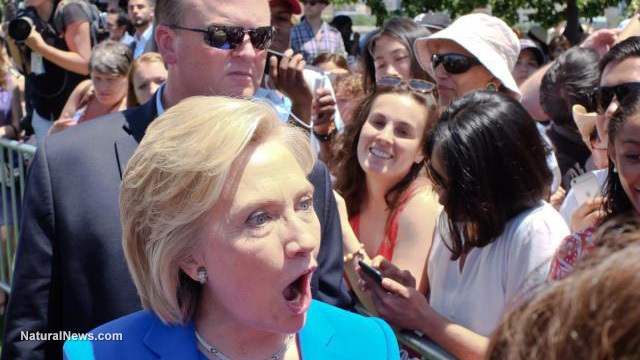 Low ratings – or bad Clinton health review? Known for his role as an addiction therapist on VH-1’s Celebrity Rehab, Pinsky said that after reviewing Clinton’s public health records he was concerned. He felt that with her status as a political elitist she ought to be receiving top-notch care, but both Pinsky and a colleague made the observation that her medical care does not appear to be up to standard, after discovering that she is taking a medicine that was popular in the 1960s. “Both of us concluded that if we were providing the care she was receiving, we would be ashamed to show up in a doctors’ lounge. We would be laughed out. She’s receiving sort of 1950s-level care by our evaluation,” he said on KABC‘s McIntyre in the Morning show. “Pinsky said Clinton has received unconventional treatments over the years, calling the medical decisions ‘bizarre’ and speculating that it could be causing uncommon side effects,” reported Fox News. Clinton fell and hit her head in 2012, suffering a “transverse sinus thrombosis,” a condition Pinsky said was an “exceedingly rare clot” that he had only seen once in his career. He added that the medication that Clinton is receiving may actually have led to problems with her “coagulation system,” meaning that the very medications her doctors are utilizing could be causing her problems. And now, Pinsky’s show has suddenly – and quietly – been canceled. According to Deadline, a media and Hollywood themed news site, Pinsky’s show goes away in September, ostensibly as part of a shake-up of HLN, or Headline News, which is part of CNN. The site noted further that Pinsky will remain on as a contributor to CNN, and hinted that the cancellation of his show was due to low ratings. “Dr. Drew and his team have delivered more than five years of creative shows, and I want to thank them for their hard work and distinctive programming,” CNN EVP Ken Jautz said in a statement confirming that Pinsky’s last telecast will be September 22, as reported by Deadline. Pinsky survived a previous rebranding of HLN just over two years ago, when the network, flagging in ratings, announced it would become the first for the “social media generation,” by redefining television news and information to cover what is trending, being shared online and going viral across all platforms. Deadline also mentioned Pinsky’s recent comments about Clinton’s health, hinting that perhaps it might have cost him his show, because as the website claimed, his comments “played nicely” into Trump’s assertions that she is neither fit nor healthy enough to be president. It very well could be that Pinsky’s show ratings were not what the network would like, but after keeping him on two years ago during a previous rebranding, it seems more than just coincidental that the network would dump him now. Perhaps the network execs at HLN and CNN, the latter of whom are clearly in the tank for Clinton, used his comments as a final straw. Either way, the mainstream press continues to shill for and protect Clinton, despite her being one of the most politically compromised presidential candidates in the history of the country.